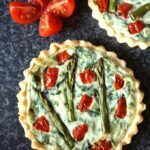 Tomato, Spinach and Asparagus Tartlets with Ricotta, or mini quiches, a delicious brunch recipe for Easter that uses fresh seasonal produce. 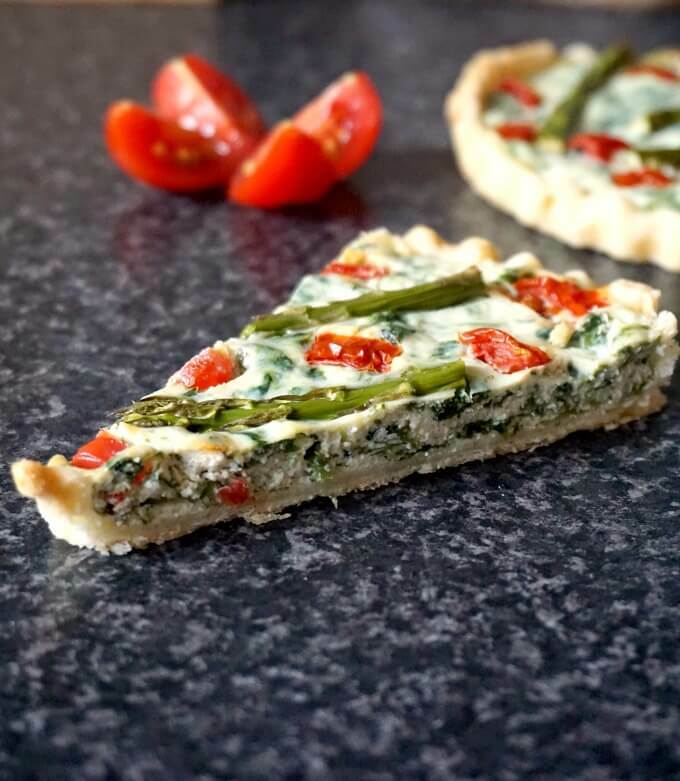 With a flaky base, a creamy ricotta and spinach filling, and topped with tomatoes and asparagus, these tartlets can be enjoyed by the whole family. The perfect appetizer all year round. I often buy either ready-made puff pastry or shortcurst pastry, most of the time without having a recipe in mind. I usually say to myself that inspiration will come once I open the fridge and see what other ingredinets I have in there. 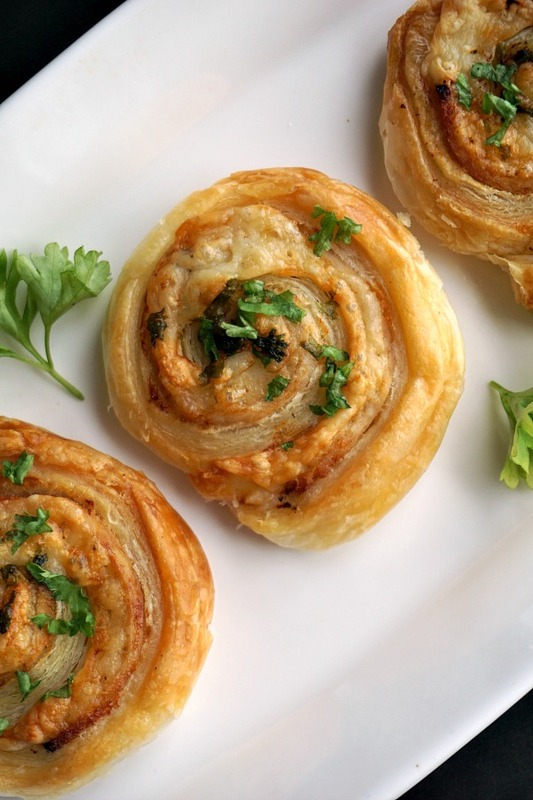 The last time I bought puff pastry, I made the Spinach Pinwheels with Ricotta. I happened to have ricotta again, but I thought I better try something else this time. I admit that I tend to repeat the same dishes over and over again, especially when I know that my daughters like them, and are likely to refuse a new dish. Surprisingly, they did like these tartlets, and quite enjoyed them, so I was truly chuffed. Yep, another successful recipe! Pfew! I prefer using shortcrust pastry for all quiches, savoury tarts, or pasties, but if you have puff pastry, that should not be a massive problem. You do need to blind bake it though before the filling goes in, otherwise you end you with tartlets that have soggy bottom. Make sure the pastry is cold. 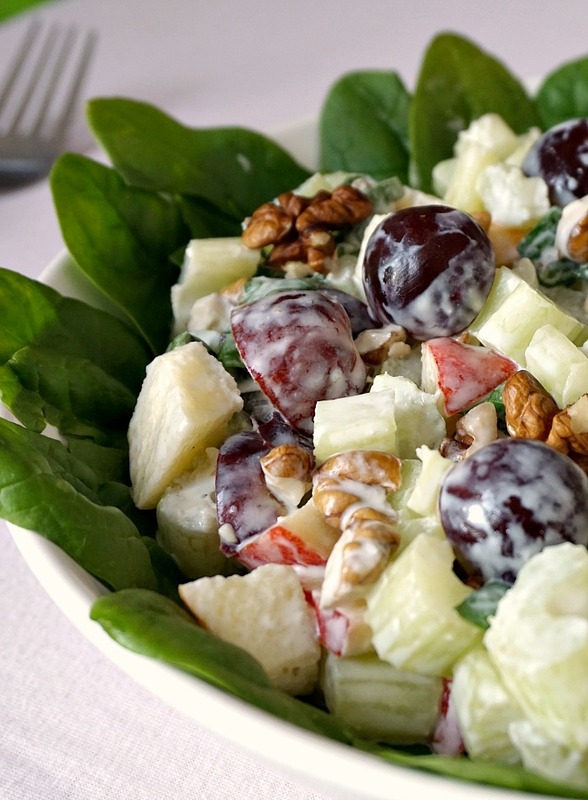 If you choose to make it yourself, refrigerate it for at least 30 minutes before baking it. Blind bake it for about 10-15 minutes, before you add the filling and further bake it until it’s completey cooked. If you don’t have baking beans, just use rice or any other dry beans. Make sure you first use perchament paper over the pastry before adding the beans. The filling must be COLD before you add it to the pre-baked pastry. In this case, there is nothing hot anyway, but if you make pot pies, or anything similar, wait until the filling reaches room termperature. 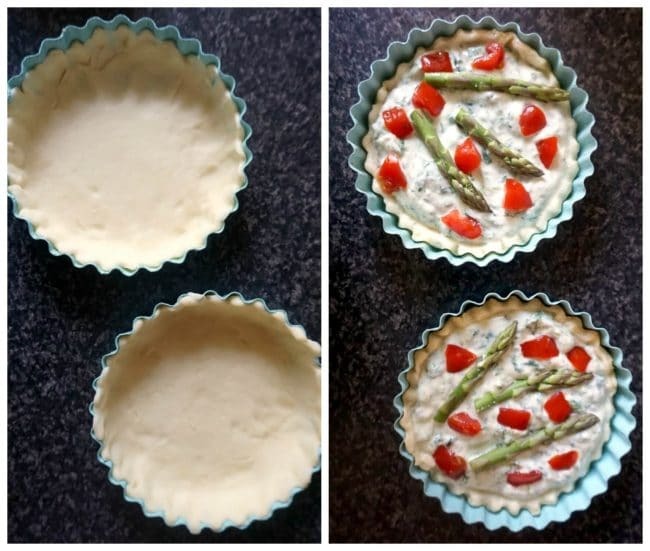 Feel free to add any other vegetables you like, the result will be some impressive tartlets that everyone will just love. I prefer them cold, but warm should also do. 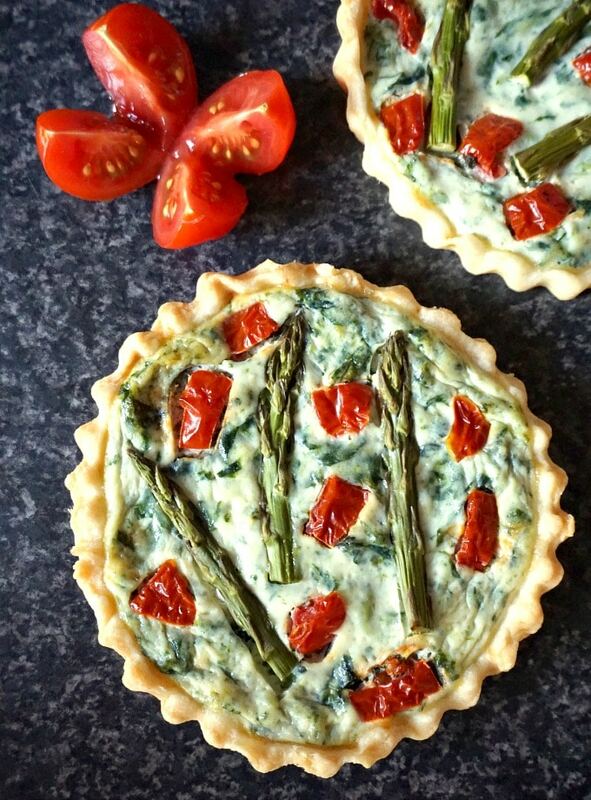 If you’ve liked my TOMATO, SPINACH AND ASPARAGUS TARTLETS WITH RICOTTA or any other recipe on the blog then don’t forget to rate the recipe and let me know how you got on in the comments below, I love hearing from you! You can also FOLLOW ME on FACEBOOK, INSTAGRAM and PINTEREST to see more delicious food and what I’m getting up to. Cut the pastry in 4 round circles that are about 1-2 inches larger than the tartlet tins you are using. Press the pastry down using your fingertips. Prick the base of the pastry with a fork, then line perchament paper over the pastry, and fill the tins with baking beans. Bake in the pre-heated oven at 180 degrees Celsius (350 Fahrenheit) for about 10-15 minutes, or until the the pastry is firm, but not golden brown. 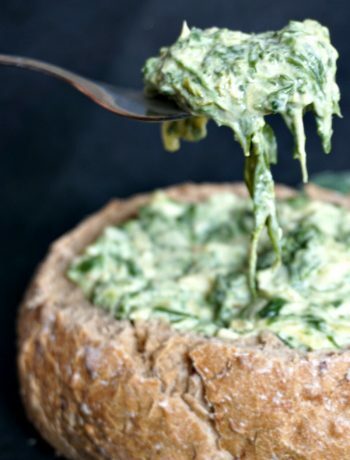 Mix the thawed spinach with the eggs and ricotta, then sprinkle semolina over each pastry case, then fill with the cheese mixture. Top with the chopped tomatoes and asparagus tips. Bake for a further 25-30 minutes or until the pastry is golden and the mixture is set.